A few thought leaders and visionaries explained the theory and vision of DAOs/DACs, but missing from the literature are real experiences and a deeper dive into the realities of operating a DAO. Certainly not all DAOs will be born by following a cookbook. And there will be variations and shades of purity in DAO principles, for practical purposes. So how do you get there, and what are the pieces of the puzzle from an operational / practical view? The users are at the center of this evolution, and so is the architectural backbone to support these user actions. 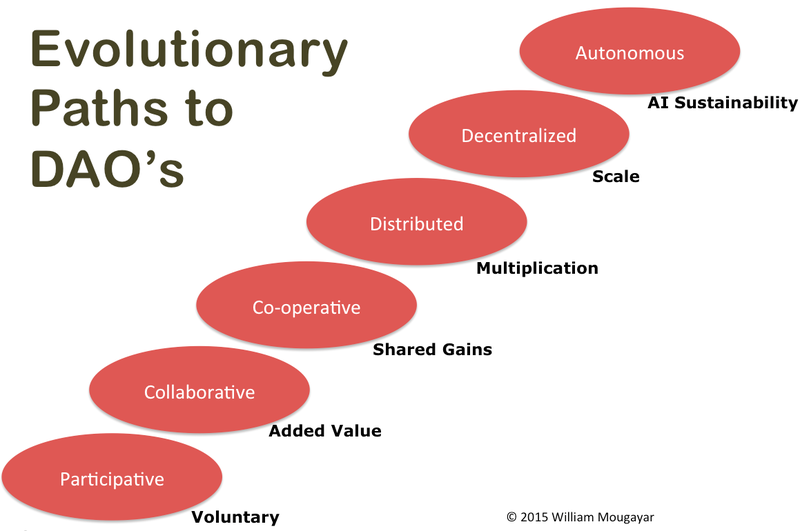 Note that the participative/collaborative/cooperative functions are user-based, whereas the distributed/decentralized/autonomous ones are architecture-based. 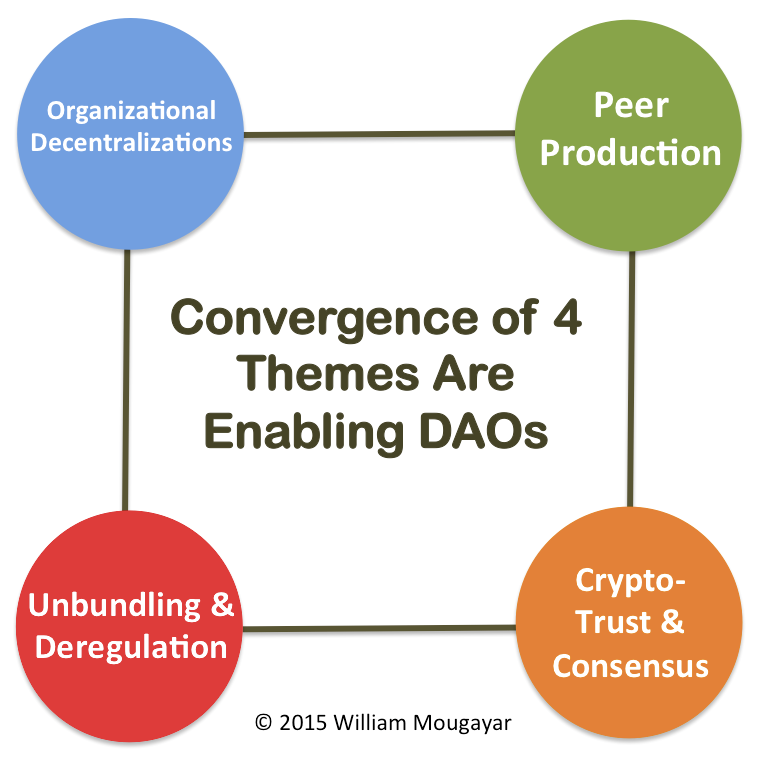 There are 3 ways to be involved in a DAO. You can buy shares / cryptocurrency / tokens, or they can be granted to you, or you can earn them. The earning part is interesting because it involves some work that is active or passive. An example of active working includes delivering on bounties for specific projects such as finding bugs, developing software, ethical hacking, or any task that is required by the DAO. Passive working is typically accomplished by sharing something, such as your computer processing cycles, Internet access, storage, or even your data. What you receive in return for your stake can also take many forms. Of course, the traditional instrument is a share (or a warrant/option for shares), but value can also come in points, tokens, rewards or a cryptocurrency. Note that tokens could have multiple purposes, as they can represent product usage rights or ownership rights tied to some intrinsic value. Getting governance right is not easy, but it must be done. Autonomy doesn’t imply anarchy, so you’ll need to think about the various parts that make up governance, whether or not stakeholders are involved actively (e.g. voting, managing, creating rules, checking rules, decision-making, reporting, regulations), or passively (e.g. feeling empowered, valued, respected, fairly compensated). Regardless, transparency in governance must prevail. In the traditional sense, we’ve had profit sharing or dividend participation as a form of collective gain re-distribution. But in a DAO these benefits might include voting/special rights, or being given a special status. Ultimately, there has to be value growth via internal capital appreciation in the form of cryptocurrency or cryptographically secure tokenization of some sort. The blockchain and cryptocurrency-based protocols and platforms are just enablers for the consensus mechanism. Typically, these are open source decentralized consensus and decentralized trust protocols that enable the irrefutability, verifiability and veracity of all transactions and smart programs. These protocols can be general-purpose (e.g. Ethereum, Bitcoin), or special-purpose (e.g. La’Zooz for decentralized transportation or MaidSafe for decentralized storage). There are 3 additional functional components that should be included in the technology platform: a) a User data layer, with an assumption that data is owned by the user, and only accessible in a specific aggregate or blind form by the DAO, b) Smart programs which are the actual transaction engines, c) various API’s to interface with value-added services or partners that are ancillary to a DAO. Let there be no mistake that the key objective of a DAO is value creation or production, and to make that happen, there needs to be a specific linkage between user actions and the resulting effects of those actions on the overall value to the organization, as symbolized by the value of the cryptocurrency that is underlying it. That’s where entrepreneurial creativity needs to take place, and where business models will be concocted. Usage without value linkage is a waste and will result in a failure backlash. But there’s a warning here. Many of these DAOs will be theoretical in their inception stages. A pre-sale only enables the DAO to start on a path. At the end of the day, a new DAO is like a startup. It requires a product/market fit, business model realization and a lot of users/customers. Early on, a lot of assumptions are made, and the DAO may resemble science-fiction until the product/service hits the market forces realities. The “proof of success” will be sustainability in the market, not the pre-sales success. I believe that getting to a DAO is a stepwise, gradual building block process that is made-up of several pieces. I think DAC/DAO is a construct which will have degrees of purity in its implementation. There will be cases where only a % of a company is a DAC or operates like one.